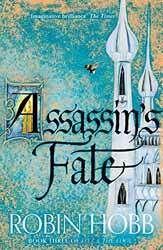 Assassin’s Fate is the third and final book in Robin Hobb’s The Fitz and the Fool Trilogy. Time will tell if this is a fitting end to a story which started twenty years ago and has been spread across three trilogies. The story is told from two perspectives. The first is Bee, abducted because the servant of the four believe that her destiny will bring great peril to The Whites of Clerres and so she must be either controlled or killed. In a very true way the book tells of two journeys to the same destination. The second perspective is that of Fitz who is travelling with his long-time bromance, the Fool, also destined to come to Clerres. There was a lot to get through in the book to bring the three trilogies to a close and so it is only going to be of interest to those already invested in this world, it does not work overly well as a stand-alone novel. For those that are, the book peels back layer upon layer of truth and answers questions that have lingered in the story for a long time. Not all the reveals are pleasant and this is likely to be an emotional read for fans. Hobbs undoubtedly has skill as a writer of fantasy fiction and generally I look forward to her next book, but I did feel that the book could have done with some judicious editing as the pace can slow down to the positively glacial, especially in the passages not containing Bee, who I thought had more to do and so was more interesting to read about. Fitz spends an inordinate time talking with Fool, necessary perhaps to finally reveal a lot of the mysteries of the trilogies, but often these talking heads passages ended up being a little repetitious and slowed their respective parts of the story. Even with that caveat Hobbs has drawn to an emotionally satisfying close to her story, which will probably bring deserved praise from her audience and not leave a dry eye in the room.